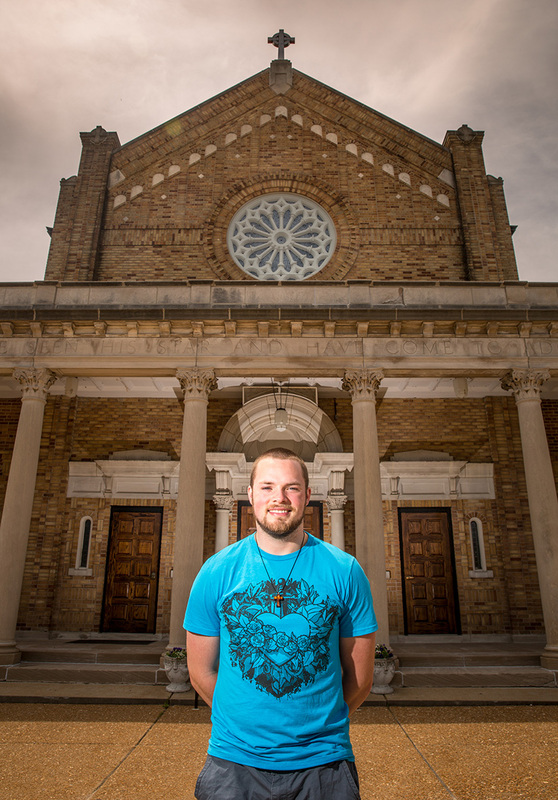 Adam Yancey enjoys visiting various churches for daily Mass. The student at Truman State University has attended Mass at at least 40 churches in the archdiocese. You have visited many churches in the archdiocese for daily Mass. What motivated you to do that? I’m up to 40 (visits) now. There’s a lot of reasons I do it. One is how beautiful all these churches are. I was listening to a talk by the lateBishop Fulton Sheen one day describing the Mass as basically taking our crosses and placing them at the great cross of Christ. The same thing happens in New York, Tokyo, here. That got me thinking that it happens in my parish, at the parish next door. There’s a lot of places where I can drive around and experience a Mass that’s exactly the same as anywhere around the world while taking in the beauty of these churches. I’ve been to Savannah, Ga., and went to the cathedral there and that was absolutely breathtaking. I’m going to Memphis and will see what’s there. What more did you find in those experiences? Every church building is different, but that doesn’t make them any less beautiful. There are some I subjectively think are prettier than others — such as St. Luke the Evangelist or St. Francis de Sales, those are gorgeous — but every church has something different about it that draws my attention to heaven, whether it be the stained-glass windows or a mosaic of Mary. Adam Yancey posed for a picture outside Epiphany of Our Lord Church in St. Louis. Tell me about your involvement with the Catholic Newman Center at Truman State University. In my role I reach out to the university and to the Catholic community of Kirksville. I’m on the committee of Mary Immaculate, the Catholic parish in Kirksville. I’m also planning a retreat for the freshman, a week dedicated to welcoming them to Truman and Newman, helping them make friends and establish a community. What attracts you to the Newman Center? First of all, it’s a Catholic community where you can receive the sacraments. For a while it was my go-away place because I’d be so tired of football that I’d go to Newman to enjoy the people and atmosphere, be happy with the people I love. It’s turned into a home and family for me. Also, I’m challenged there to live a better life and focus my attention on something holy instead of something earthly. Why is your faith an important part of your life? Nowhere else can I experience pure love. The Church is where I find authentic love, that agape love so freely given to us. A phrase I like to live by is just those two words, “I love.” It extends from what the Church has given me. And it’s my responsibility to give that love back to God, give it to other people. Why do you enjoy sports so much? I love adrenaline, going on roller coasters, anything like that. Football taught me to be a leader, how to have confidence in myself. Sports allows me to express myself. Both my parents were athletes in high school and college. My dad was a football coach and wrestling coach. I’ve taken up intramural sports — flag football, volleyball and roller hockey. I go to the football field and I’ll do agility stuff to get a good workout or run around the track a bit. What are your plans when you graduate in December? I’m looking at going to grad school at Southern Illinois University-Edwardsville, studying sports and exercise psychology. I’ve been an athlete my entire life and I want to stay close to that.